It is situated right at the City Centre overlooking harbor and seaport. 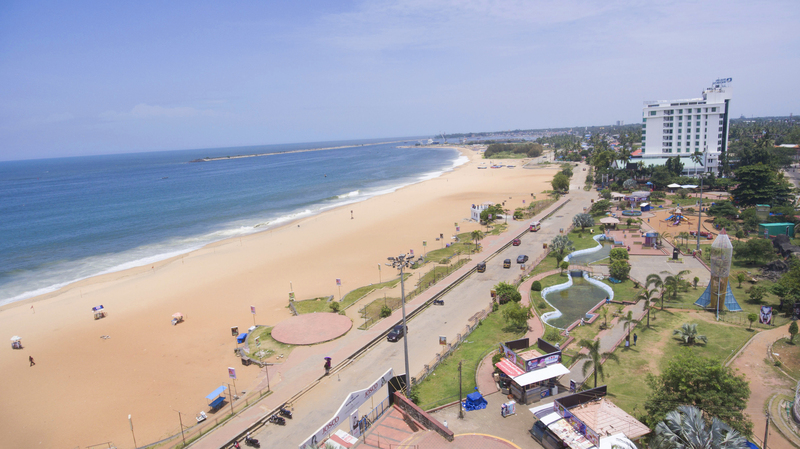 The beach also features a park of international standard, called the Mahatma Gandhi Park. It is an ideal location to enjoy the sunrise and sunset; it offers a mesmerizing view of the Arabian Sea. The view of the sea will keep you in trance for long. In the night thousands of fishing boats hovers the ocean with twinkling lights like a galaxy of stars. You can also enjoy street food, beach soccer, beach volley, kite flying and much more at the beach. Kollam is a port city and one time active harbor for Chinese ships and trade, Kollam Beach is home to Chinese fishing nets, Chinese water pots and sampan-like boats seen even today. Kollam Beach is the first ‘Beach Wedding Destination’ in Kerala.